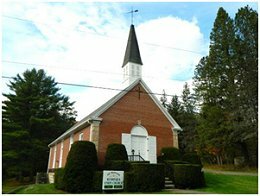 Kushequa Union Church is located in the beautiful Kinzua Valley alongside Kinzua Creek in the village of Kushequa, Pennsylvania. The church was first organized in 1892 by A.B. Cody of Bradford, PA. On March 8, 1892 the church’s society incorporated and the following men were incorporators: Elisha K. Kane, A. Sweetland, I. S. Cook, William Simpson, and Harry Eshbaugh. Construction on the original church began in early 1891 and was completed later the same year. In the fall of 1893 the church was dedicated and used for 50 years until fire destroyed the original structure on November 13, 1943. The foundation block for a new church building (the present structure) was laid on Mother’s Day in 1944 and the first worship service was held in September of that year despite the fact that pews were unavailable due to World War II. 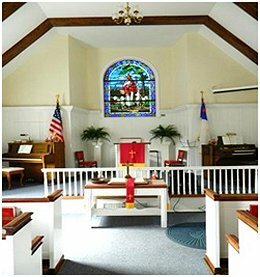 Kushequa Union Church is full of history and anecdotes: Prior to the first church burning, every summer the Sunday school class had its annual picnic. Special cars were attached to the railroad locomotive and the town boarded the train and set out for the picnic grounds located about ten miles up the valley from the church. Mr. Kane rode the train and distributed dimes to all the children and everyone joined in song.